I don't believe the nipping behavior is entirely due to hunger. More feeding won't likely solve the problem. Fish can suddenly exhibit behaviors for various reasons. It could be because it is more comfortable in its new environment. Maybe it's a territorial reaction. Maybe the clownfish is exhibiting a behavior that is triggering the nipping. I know that Live Aquaria has both of these fish listed with a 30 gallon minimum tank size. However, I suspect that your 30 gallon tank is a contributing factor. I don't see a good solution for you, and it seems unfair to keep the clownfish in a dangerous environment. I really don't want to see a pic of the new injuries. But I imagine that the damaged tail will not completely grow back. Still some people like providing homes to blemished fish. Since you are "desperate for a solution", a much larger tank with extensive rock work might allow the two to live in the same tank. I'm thinking maybe something like a 75 gallon or larger. 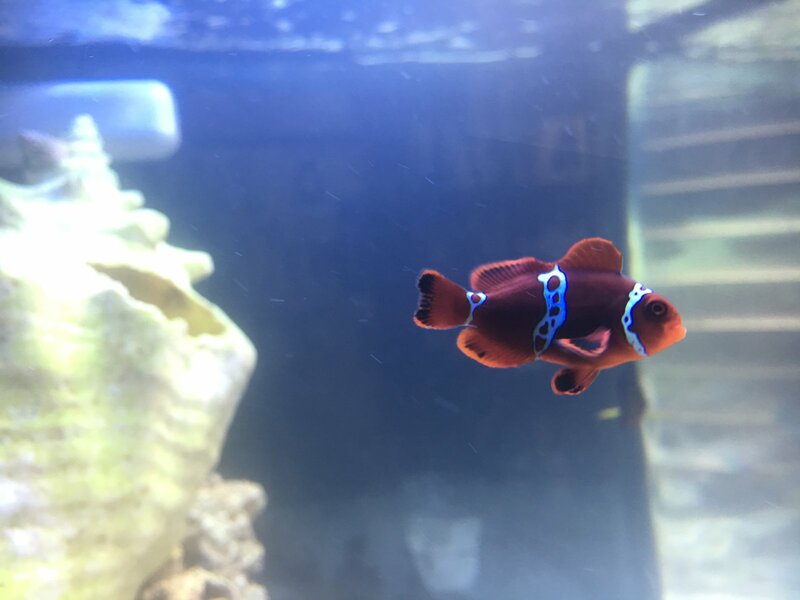 In the meantime, I would check around to see if someone would be willing to hold your clownfish until the new tank is fully cycled. Weird how the clownfish is getting bullied. When I was younger I used to keep aggressive fowlr tanks . I was young and dumb so I I completely over stocked my tanks with triggers, groupers, eel, puffers, lion fish. I had a maroon clown in that tank as well and man did he hold his own, even became the boss of that tank. Seems crazy that little puffer would be that aggressive towards a maroon clown..
Just a word of caution if that puffer and clown work out there differences before the puffer kills the clown you surely won't be able to add any more fish because those two will own the tank..
Was not easy but I re-homed the puffer. Not gonna lie, pretty devastated. That fish was the first saltwater fish I have ever wanted and it just didn’t seem to work out. Right when I think I know everything about taking care of fish, stuff like this happens. I mean I’m only 16, I got a lot more to learn, but saltwater tanks can get overwhelming and I thought I was doing a good job I have been very successful in the past with my other tank so this is kind of a bummer for me. Sorry for rambling, needed to get that out Anyways, moving on from now, what can I do to help the healing process for my clown? I wouldn't necessarily say you did anything wrong; it just didn't work out. Good water quality and good quality food should help your clownfish recover. Watch for signs of infection (in which case, you might have to treat it). What food would you recommend? Right now I am feeding brine shrimp and green marine algae. Also how would I know if it is infected? I have never used anything to help them heal besides keeping them well fed and keeping good tank parameters.. I've read a few of your posts seems like your on the right track on becoming a good reef keeper. Just keep reading and learning . Remember this is a hobbie it is supposed to be fun so when things mess up don't let it stress you out, view it as a challenge and a chance to learn.. Fyi I've had the most "peaceful" fish become terrors, reef safe fish eat corals. Every fish has it a own personality nothing you can do about it. Yeah I understand. Thanks so much for your help, you’ve been a great encouragement! Right now I am feeding brine shrimp and green marine algae. Brine shrimp is not very nutritious. Rod's Food is good. Frozen mysis is much better than brine shrimp. I usually feed a good quality flake or pellet, then supplement with a good frozen food. I’m happy to say that my clown’s tail is growing back nicely! I have had him on Mysis shrimp for the past week and he LOVES it. Occasionally I will feed him the Rod’s food, just a little messy and sometimes too much pollutes the tank. Haven’t seen any signs of infection and overall he is doing great. Just wanted to update you guys. Thanks so much for the help. Did you get your water to clear up yet?? I imagined much worse. I'm glad she's doing better! Same with me, but I guess I got lucky cuz she’s actaully very peaceful...for know at least. And Yes!! Reduced photoperiod and bought a pretty cheap uv sterilizer. Cleared up within 2 days and it hasn’t looked better!! Me too! Thanks for the food suggestions, really helped. I have a Valentini puffer in my 50 gallon tank with Maroon Clown fish too. He was first swimming back and forth at the top. Now today he is staying low to the bottom and not eating. Is that q bad sign? It's an educated guess, but he's probably getting bullied by the maroon. If he's been established in the aquarium for awhile and suddenly stops eating then that is a bad sign. Check your water parameters for anything that may be off as well as keeping an eye on the Maroon to see if it's picking on the puffer.